The public library is my single favorite “free” resource in my community. In fact, I value it so much that I actually posted a visual tour of the local library I use the most on this site a few years ago. A good library isn’t some unique resource that you’ll just find in certain towns. 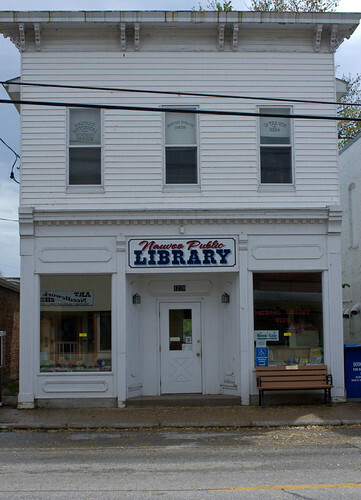 Most towns have a library, even small ones like the one depicted below. What value can you get out of your local library? I’m going to reiterate some of the items mentioned in my “tour” post above, along with some other value that libraries contribute. Books Yes, libraries are a warehouse of books that you can check out for free. You can also find magazines, newspapers, tax documents, and other such printed material at the library, too. Beyond that, most librarians are quite happy to share their expertise in helping you find the right book for your needs and interests. Music Most libraries have a collection of CDs that you can check out for your own enjoyment. Larger libraries even have musical discovery programs to help introduce you to new kinds of music that you may never have known about before. Films Many libraries have DVDs that you can check out. Some libraries carry this further and show films at the library. Larger libraries even have a small auditorium which goes a long way toward creating a theater-like experience for free. Cultural events Libraries often host muscial groups, speakers, and presenters of all kinds for the public to enjoy. At my own library, I’ve heard authors speak and bands perform. I’ve seen jugglers juggle and movie directors present their work. Audiobooks Going on a trip? Your library likely has a good collection of audiobooks to check out that will make your travel a lot more enjoyable. Meeting places Many libraries have rooms that can be used for meetings of community groups. I’ve participated in gaming groups and book clubs at libraries, and I’ve seen everything from gardening clubs to jester training (yes, jester training) at libraries. Children’s resources Libraries often have abundant children’s resources. For example, right now my children are involved in a robust reading program that rewards them for summer reading with new books and other items, plus there’s a weekly storytime and other activities at the library for them. Internet access Almost every library today offers computer use with internet access for those who do not have access to the internet at home. Many libraries offer wi-fi access for people who bring in their laptops and other devices. Teen resources Many larger libraries offer teen programs, including rooms where teens can hang out together in a safe yet private environment. They also offer book clubs targeting teenagers. Additional community resources Some libraries offer additional services beyond these. For example, some local libraries offer battery recycling. One local library near us offers free paper recycling for people who don’t have home pick-up. Your local library has a wealth of resources right there for you to take advantage of. All you have to do is walk in the door.